Alloy Substitution: What is the real difference between 5052 and 3000 series? Lately, the buzz in highway industry news has been centered on Alloy Substitution. 5052 alloy vs 3000 series alloys… what is the difference and why should you care? – Vulcan 5052 has 39.3% more Tensile strength and 33.3% more Yield strength than 3105*. This is critical to the performance of the sign in the field. A stronger sign resists vandalism along with providing greater wind load. The lower Tensile strength found in 3105 also results in installation holes wearing out more quickly (as seen in the photo above on the left.) The 5052 alloy stop sign shown (in the photo above on the right) proves what a difference Tensile strength can make in the longevity of the sign. – Stocking only Vulcan 5052 alloy will simplify managing dual inventories, providing confidence that the alloy will stand up not only to DOT testing, but also harsh outdoor elements. Hello! Welcome to The Blacksmith’s Hammer, a blog by Vulcan, Inc. Since 1935, Vulcan’s core products and services have been linked by a common thread… Aluminum. With five vertically integrated manufacturing facilities working together, each Vulcan division shares resources as well as knowledge, providing innovative fit-for-purpose products for a wide variety of markets. 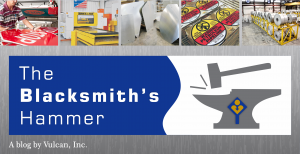 Our blog, The Blacksmith’s Hammer, is intended to be an online extension of cutting edge aluminum manufacturing and fabrication information through metalworking. Our goal is to deliver insightful articles that stream live from our campus, providing in-depth knowledge of Vulcan, our capabilities and the markets we serve. Our company and blog name say a lot about our commitment to the aluminum industry. Vulcan is symbolic of the metal industry, and is particularly appropriate for our company as melters, casters, rollers and fabricators of metal. 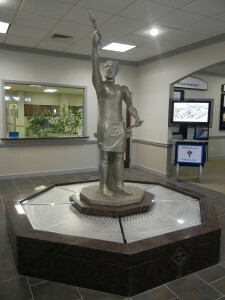 This cast aluminum statue of Vulcan is located in the lobby of our corporate headquarters. Below is a preview of a few of the topics that will be covered in this blog. We look forward to your comments and suggestions! A longstanding reputation for quality products and competitive prices has placed Vulcan at the forefront of the various markets we serve. Our many years of experience in aluminum rolling and fabrication has broadened our marketing arena to include the manufacture of aluminum coil, aluminum blanks and sheet, traffic control signs, utility signs and markers, and custom metal stampings. For more information, please visit our website.